Anil Agarwal-owned Vedanta Ltd is poised to overtake Aditya Birla group as the largest producer of aluminium in the country in the current fiscal. Vedanta, which produced 0.96 million tonnes of aluminium across its two facilities in Odisha and Chhattisgarh, is on course to clock an annual output of 1.6 million tonnes this year. As against this, the combined capacity of Aditya Aluminium and Hindalco, subsidiaries of Birla group, across four locations in Odisha, Madhya Pradesh and Uttar Pradesh is 1.32 million tonne. The group, as a whole, reduced 1.26 million tonne aluminium in FY17. 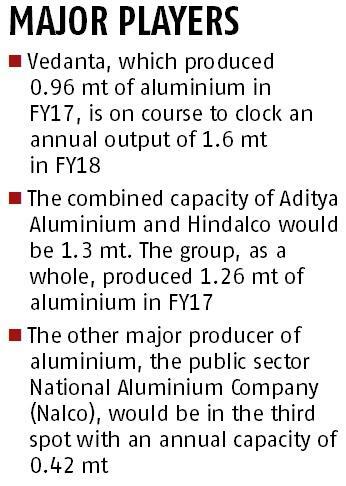 The other major producer of aluminium, the public sector National Aluminium Company (Nalco) is stuck at the third spot with an annual capacity of 0.42 million tonne. “As a group, we will be producing 1.6 million tonne of aluminium in FY18 which is 66 per cent higher than the last year’s output of 0.96 million tonnes”, says Abhijit Pati, CEO (Aluminium and Power Division), Vedanta Ltd. The major boost to the aluminium output by the company has come from its Jharsuguda facility in Odisha which is in an expansion mode. The Jharsuguda smelter is expected to produce 1.1 million tonnes and Balco plant in Chhattisgarh 0.56 million tonnes this year. Jharsuguda unit produced 0.76 million tonne aluminium last fiscal. “Four new lines of production are being readied at the Jharsuguda facility out of which work on two and a half lines are already over. The rest work will be completed by this year. So the exit capacity at Jharsuguda in March 2018 is expected to be 1.4 million tonnes”, he added. The company had built two smelters at Jharsuguda with an investment of Rs 25,000 core and a combined capacity of 1.75 million tonne, representing the largest single location aluminium facility in the world. Though its smaller smelter of 0.5 million tonnes was running for some time, the larger one having 1.25 million tonne capacity and SEZ status was largely idle due to dispute with the electricity authorities over drawal of power from the company’s captive power plant (CPP), raw material (alumina) supply constraints and overall market glut. The resolution of a dispute with the state government over access to CPP power and strengthening of LME (London Metal Exchange) prices for aluminium has aided the company to unleash the idle capacity and scale up production. With the company’s Lanjigarh alumina factory languishing from raw material crunch following denial of bauxite mining on Niyamgiri hills by the Central government, that unit is compelled it to run on low capacity on imported bauxite. As a result, the Jharsuguda smelter is unable to source sufficient alumina, the feedstock for aluminium, in house. The company is importing 60 to 65 per cent of its alumina requirement from different countries. But with the LME metal prices remaining robust, scaling up aluminium production based on imported alumina will be viable, Pati argued and pointed out that LME aluminium prices are hover over 2000 dollar per tonne for last six months and are expected to remain in the range of 2000 to 2200 dollar range for atleast next two years. Aluminium demand in the country is growing at a rate of 7.5 per cent outpacing the world demand growth of 5 percent. Pati said, with the Balco unit going for capacity addition of 0.42 million tonne and Jharsuguda unit achieving rated capacity of 1.75 million tonne, Vedanta will account for more than half of the country’s aluminium production couple of years down the line.